Students gain foundational skills through the Wilson Fundations program, which provides research-based materials and strategies for reading, spelling, and handwriting. The study of mathematics at Harlem Hebrew consists of the rigorous program Eureka Math, a carefully sequenced program, aligned to the New York State Learning Standards, where the mathematical progressions are carefully sequenced into modules. The curriculum modules are marked by an in-depth focus on fewer topics. They provide strong classroom reasoning, extensive problem sets, and high expectations for mastery. The Standards for Mathematical Practices are also incorporated within each module. The MyWorld social studies curriculum, published by Pearson and taught across K-4, uses a variety of integrated learning experiences to activate prior knowledge and help students understand “big ideas” as they relate to essential questions. Learning comes alive through storytelling, literacy instruction, and flexible resources. Stories from our world engage students and help develop thoughtful, literate citizens. Lessons apply inquiry processes, practice reading and writing, and involve collaboration and communication skills. Blended learning experiences include an interactive student worktext and digital courseware. Aligned with the New York standards for social studies and the common core, the social studies unit also includes a unit of Israel studies. In addition, for 1-2 weeks during each social studies unit, students work on their argumentative writing in ThinkCerca, an online reading and writing program. With ThinkCERCA, students read passages of text aligned with their social studies content, analyze the text, and then respond to a critical thinking prompt using a writing framework. Working in small groups, students engage with reading materials and work based on their current skill levels. The program bridges time-tested best practices, curriculum standard expectations, and technology to help prepare students to be college and career ready all while unlocking the exciting story of our nation’s history. The program is aligned with the New York standards for social studies and the common core. In addition, during social studies students practice argumentative writing through ThinkCERCA’s, online platform. Students read differentiated passages aligned to their social studies content, analyze the text and then respond to a critical thinking prompt using a writing framework. In kindergarten through second grade, students study literacy through five major parts of their day: Wilson Fundations, Close Reading for Meaning, Guided Reading, Independent Reading, and Core Knowledge. Students gain foundational skills through the Wilson Fundations program, which provides research-based materials and strategies for developing decoding skills, phonemic awareness, as well as reading comprehension, spelling, and handwriting skills. The Close Reading for Meaning approach gives students the tools to understand both the literal and deeper meaning of any nonfiction or fiction text, examine craft and structure, and develop evidence-based ideas. In Guided Reading, students work in small groups based on their current skill levels. Daily independent reading gives students the opportunity to practice their guided reading skills on texts of their choice, on their reading level. Core Knowledge Language Arts is a sequential, content-rich curriculum that builds students’ knowledge while they acquire fluency skills, vocabulary, speaking and listening skills, and writing skills. In grades K-3, the Listening & Learning strand develops young children’s language and background knowledge by exposing children to rich and complex texts through daily read-aloud, text-based and analytic discussions of the text and content. These components are further supported through Compass Learning, a web-based program that creates a personalized learning path for each student. In grades 3 through 4, students study literacy through Close Reading for Meaning, Guided Reading, Independent Reading, Core Knowledge, and Keyboarding Without Tears. The Close Reading for Meaning approach gives students the tools to understand both the literal and deeper meaning of any nonfiction or fiction text, examine craft and structure, and develop evidence-based ideas. Additionally, during small group time, students participate in Guided Reading groups, Independent Reading, or use Compass Learning (see K-1 Literacy section, above). In Core Knowledge, students in grades 4-5 read rigorous texts, engage in discussions, and produce written responses to answer text-dependent, literal, evaluative, and inferential questions about literary and informational texts. Students practice typing skills through Keyboarding Without Tears, which covers typing fluency and speed and appropriate use of online tools, also known as developing “digital citizenship”. In grades 5-8, students study literacy through Close Reading, Guided Reading, Independent Reading, and Engage NY. The Close Reading for Meaning approach gives students the tools to distill both the literal and deeper meaning of any text, examine craft and structure, and develop evidence-based ideas. Students also engage in novel study. During group time, students work on Guided Reading or Independent Reading. In Guided Reading, students work in small groups based on their current skill level. Independent reading gives students the opportunity to practice their guided reading skills on texts of their choice, on their reading level. Engage NY is a content-rich curriculum that builds students’ knowledge while they acquire fluency skills, vocabulary, speaking and listening skills, and writing skills. English is further supported by Compass Learning, a web-based individualized curriculum that generates a personalized learning path tailored to each student and differentiates below and above grade level based on the student’s individual needs. At Harlem Hebrew, Modern Hebrew is taught through the proficiency-based approach, which is considered the gold standard in foreign language instruction in the United States and around the world. Students receive one hour of Hebrew language instruction each day. They engage in meaningful interactions in the language, developing their speaking and comprehension skills at a rapid pace. As students advance through the grade levels, speaking and listening skills continue to be developed and reading and writing are introduced, developed and strengthened. Modern Hebrew is taught by native speakers, who only speak to their students in Hebrew. In just a short time, students are able to understand Hebrew and speak in simple sentences. As their skills grow, they are introduced to more complex topics and are able to communicate in Hebrew in more sophisticated ways. As students learn Modern Hebrew, they also have the opportunity to learn about the culture and history of Israel, which provides a link to other subjects such as social studies and the arts. To access the full potential of arts education, Harlem Hebrew provides focused instruction on particular art subjects and integration of arts education in the broader curriculum. For our early grade students, we offer programs in visual art, dance, and music. Hebrew language instruction is integrated into our music and arts education. The physical education program at Harlem Hebrew positively impacts students’ physical health. Additionally, it helps students develop and foster physical and athletic skills while excelling on an individual level and as members of a team. It’s important to us that while they exercise, our students make friends, have fun and improve their self-esteem. 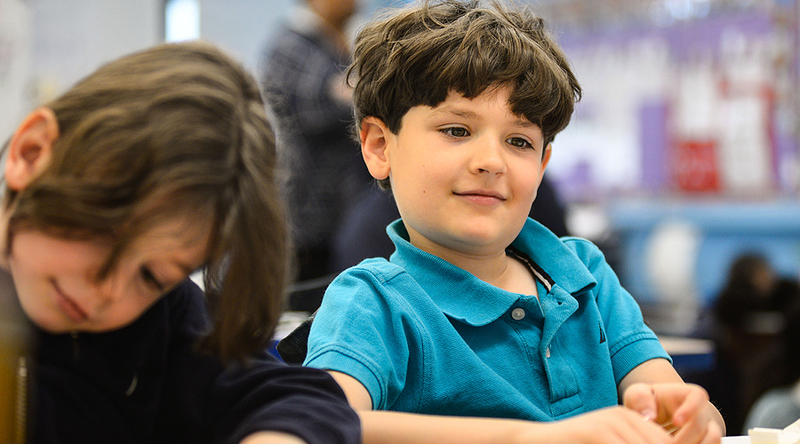 Harlem Hebrew seeks to serve all students in the least restrictive learning environment possible. The school uses an inclusion model for educating our students with special needs to ensure regular interaction among all students. Special education students are removed from the classroom only when appropriate services cannot be provided in the regular classroom setting. Our teachers and support staff are mindful to ensure a positive learning and emotional environment for all our students, and to ensure that every student develops a sense of belonging with fellow students, teachers and support staff. Students participate in hands-on experiences related to the history and geography of Israel throughout the school year. With the network’s partnerships with Israeli organizations, our students enjoy various field trips and special assemblies that help them learn about the country and its culture. For example, Tzofim Caravan, a performing group of Israeli scouts, visits the school every spring; there is a school-wide Israel Day celebration, where staff and students come together to enjoy Israeli food, dance, songs, and other activities related to the culture of Israel. At Harlem Hebrew, our students’ discovery of the world starts with an exploration of the rich cultural history of their immediate community – the Harlem neighborhood. Through an investigation of Harlem, our students come to understand the profound impact migration has on a neighborhood, a city, and in turn the world. They explore the art, music and literature of the famous Harlem Renaissance, learn about Harlem’s rich and complex history, and develop a fuller understanding of the Harlem of today.